Welcome to visit jtfurnace dot com. 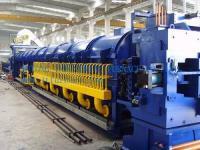 Single Billet Hot Shear Furnace is the pre-process using by al extrusion, and mainly used in heating billet, using gas spurt heating and hydraulic hot shear assemble. Its production flexibility, high auto degree, better operation environment and low energy consumption. It makes up of five parts: Store and push feed machine, spray heating furnace, hot log shear, transport machine, electrical appliance. Advantages: 1 Diameter: 70-320mm 2 Length: 6000-8500mm 3 Store billet quantity of back material shelf:5 5 Temperature uniform: 5 Degree Celsius 6 Fuel: NG 8500kcal/m3 7 Consumption: 25-45m3/h 8 Production rate: 60-100s/time 9 Sheared billet length: 350-1000mm 10 Total water consumption: 1T/H 11 Air compress consumption: 0.6m3/min 12 Combustion blower: 5.5-15kw 13 Smoke exhaust blower: 7.5-22kw 14 Bydraulic station motorpower: 22-45 kw 15 Heating zones: 2-7 Detailed product specifications, please email to us jtfurnace at hotmail dot com. Our company is specialized exporter, manufacturer and supplier of China Single Billet Hot Shear Furnace, Extrusion Machine in china.